The weekend approaches. You're thinking about hitting the bar with your friends for your favorite margarita that your buddy the mixologistmakesjust so perfectly. 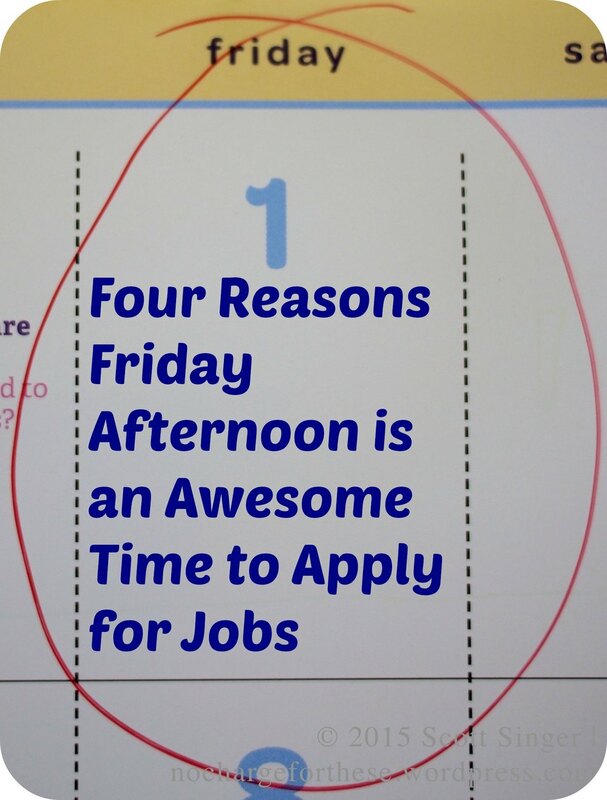 Why apply for jobs on Friday Afternoon? Fewer people do! Job applications drop on Friday as everybody else is thinking about the weekend. You will stand out. As a corollary to the last item, Recruiters will also be thinking about the weekend. They'll have tried to review candidate applications received during the week. Why not help them end the week on a high note by sending them the right candidate (you) at an opportune time? You're feeling good about reaching the weekend. Consider everything you have accomplished during the week. Why not harness that positive energy into a great cover letter for your targeted email or application? A great attitude in your communications comes through. There are fewer meetings scheduled for Friday afternoons than there are during the rest of the week. In addition, email volume tends to go down then, too. There's a decent chance you can reach your intended target. Older PostWhat Should I Believe About Online Employer Reviews?